This artist concept depicts the process of Mars orbit insertion of the MAVEN spacecraft. A NASA mission to Mars led by LASP is set to slide into orbit around the red planet on Sept. 21 to investigate how its climate has changed over the eons, completing a 10-month interplanetary journey of 442 million miles. The orbit-insertion maneuver will begin with six thruster engines firing to shed some of the velocity from the spacecraft, known as the Mars Atmosphere and Volatile EvolutioN, or MAVEN mission. The thruster engines will ignite and burn for 33 minutes to slow the spacecraft, allowing it to be captured into an elliptical orbit around Mars. Following orbit insertion, MAVEN will begin a six-week commissioning phase that includes maneuvering into its final science orbit and testing the instruments and science-mapping sequences. 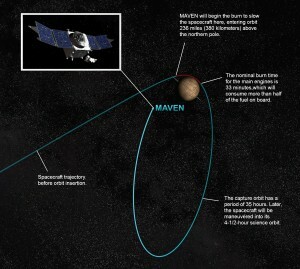 Thereafter, MAVEN will begin its one-Earth-year primary mission, taking key measurements of Mars’ upper atmosphere. Clues on the Martian surface, including features resembling dry lakes and riverbeds as well as minerals that form only in the presence of water, suggest Mars once had a dense atmosphere that supported liquid water on the surface, Jakosky said. MAVEN launched from Cape Canaveral, Fla., on Nov. 18, 2013, carrying three instrument suites. 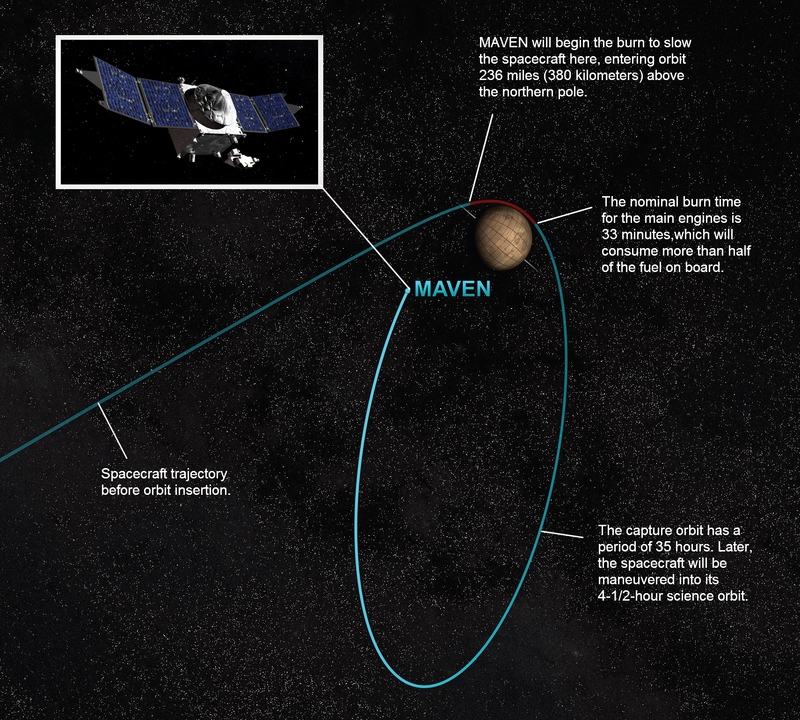 MAVEN is the first spacecraft dedicated to exploring the upper atmosphere of Mars. The mission’s combination of detailed point measurements and global imaging provides a powerful way to understand the properties of the upper atmosphere. NASA’s MAVEN mission has a decidedly Colorado connection: In addition to CU-Boulder providing the project lead, science operations, two of the science instruments and leading education and public outreach for the mission, Lockheed Martin Space Systems of Littleton built the spacecraft and is responsible for mission operations, while United Launch Alliance of Centennial provided the launch vehicle. Flight controllers at Lockheed Martin Space Systems will be responsible for the health and safety of the spacecraft throughout the process. The spacecraft’s mission timeline will place the spacecraft in orbit at approximately 7:50 p.m. MDT. In addition to making measurements of Mars, the MAVEN team also will have a unique opportunity to use a CU-Boulder instrument package on board known as the Imaging Ultraviolet Spectrograph to look at a wayward object known as Comet Siding Spring as it streaks by Mars in October, said Jakosky. Believed to be made up of pristine material present during the solar system’s formation more than 4 billion years ago, the comet will be making its first-ever pass through the inner solar system. The concept for MAVEN, developed beginning a decade ago, came to fruition in 2008 when MAVEN was selected by NASA over 19 other proposals from around the country for Mars missions. The MAVEN science team includes three LASP scientists heading up instrument teams—Nick Schneider, Frank Eparvier and Robert Ergun—as well as a supporting team of scientists, engineers, mission operations specialists and students. NASA’s Goddard Space Flight Center manages the project and provided two of the science instruments for the mission. Lockheed Martin built the spacecraft and is responsible for mission operations. The University of California, Berkeley’s Space Sciences Laboratory provided four science instruments for the mission. NASA’s Jet Propulsion Laboratory in Pasadena, Calif., provides navigation support, Deep Space Network support, and Electra telecommunications relay hardware and operations.